1. 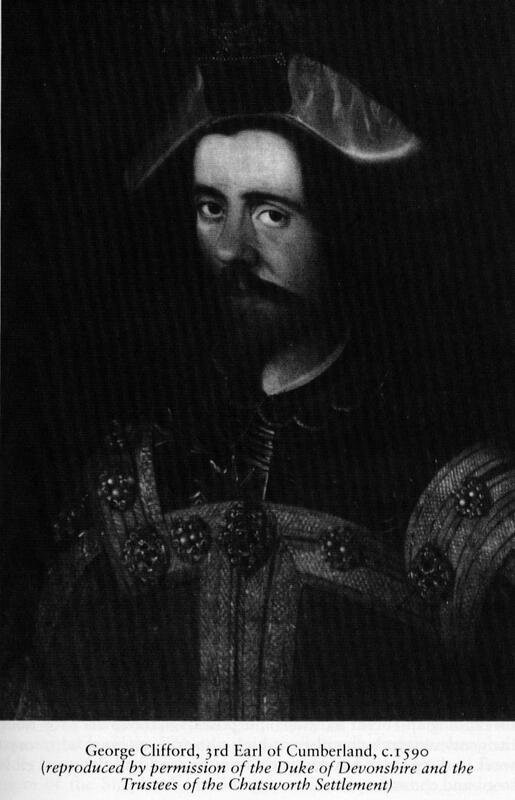 George CLIFFORD, son of Henry CLIFFORD (1517-1570) and Anne DACRE (1538-1581), was born in 1558. He was a Sailor. He had the title '13th Lord Clifford, 3rd Earl of Cumberland'. He married Margaret RUSSELL in 1577. He was an Admiral who fought against the Armada.1605. 6. Lord William DACRE 3rd Lord Dacre of Gillesland had the title 'third Baron Dacre of Gilsland'. He appeared in the census. He celebrated his Bar Mitzvah. He died in 1566. He married Elizabeth UNK. Dacre was summoned to parliament from 3rd November, 1529, to 21st October, 1555, in th efirst writ as "Willielmo Dacre de Dacre adn Greystock, or "de North". In the 26th Henry VIII, this nobleman being accused of high treason by Sir Ralph Fenwyke, was brought to trial before his peers at Westminster, in the July of that year, and acquitted, owing to the description of evidence by which the charge was sustained, namely, persons of mean degree from the Scottish border, who were either suborned, or brought forward by a vindictive feeling towards Lord Dacre, arising from the severity with which he had executed the duty of warden of the marches. In the reigns of Edward VI, Mary and Elizabeth, his lordship was captain of the Castle, and governor of Carlisle, and in the second year of the last Queen he was joined in commission with the Earl of Northumberland to negotiate a peace with Scotland.